A winner in France and a Group 1 performer in Hong Kong. But it's in Singapore where American bred CIRCUIT LAND notched his first group success when he took out the S$500,000 Chairman's Trophy at Kranji here tonight. 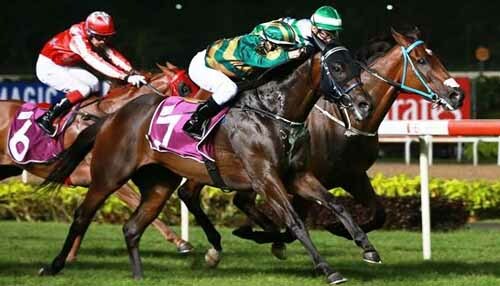 After a creditable sixth in the Committee's Prize in his Singapore bow last month, the seven-year-old carved out a hard-fought win in the Singapore Group 2 1600m contest, thanks to a brilliant ride by Macau-based Brazilian jockey Ruan Maia. CIRCUIT LAND was the only ride of the meeting for Maia who was making his Singapore debut. "Thank you so much to the owner and the trainer. I’m very grateful for the opportunity to ride here for the first time, and to win at my first ride in a Group 2 race is even more amazing,” said Maia. "I saw this horse’s last race and he ran well even if he had some problems. I had him in a good position in the race, but I didn’t want to go too early as I noticed he had a short burst." For trainer Lee Freedman, it was his first group win since relocating to Singapore last year. "“I’m very proud of winning my first Group race in Singapore. I’ve won many Group races in my career, but this is a real thrill," Freedman said. "This horse ran a great race in the Committee’s Prize." CIRCUIT LAND had a win and five placings in eight starts in France. In Hong Kong, he picked up four wins but also raced against the best, with placings in the HK Group 3 The January Cup and Lion Rock Trophy. He also finished fourth in the Group 1 The Champion's Mile.